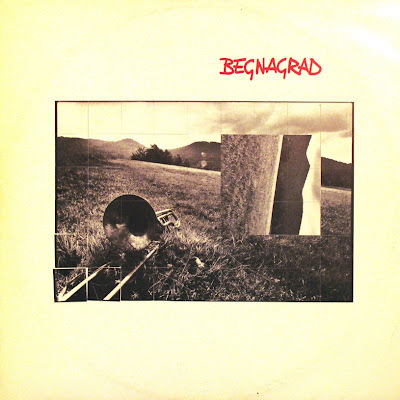 Slovenian avant-garde band BEGNAGRAD was formed in Ljubljana (Slovenia, ex-Yugoslavia) in 1975, with following members: Bratko Bibič-accordion, vocal; Bogo Pečnikar-clarinet; Igor Muševič-drums and Vlado Špindler-bass. They recorded early material in 1977 at a Novi Sad radio station, but that was not released before 1992. This formation played an unconventional blend of jazz, rock, swing and European folk traditions, particularly mixing the Alpine, Mediterranean and Balkan influences. This line-up disbanded in 1978, just to be re-formed in 1981 with new members: Nino de Gleria-bass; Aleš Rendla-drums, violin and Boris Romih-guitar, with Bibič and Pečnikar as old members. They finally recorded their first and only album "Begnagrad" in 1982. The band was short-lived and ceased to exist in 1983. B. Bibič continued a solo career along with participation with several groups like THE MADLEYS and NIMAL. Amazing RIO album- thank you very much!